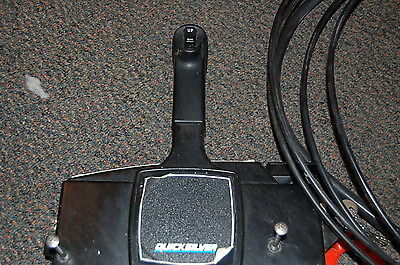 outboard mercury engine controls with mounting plate hardware trim switch 12 foot cables and key. 8 pin traditional harness will fit mercury outboards. 1994 Sea Ray 400 Express Cruiser (CURRENT OWNER OF 4-YEARS) DON'T MISS THIS 1994 SEA RAY 400 EXPRESS CRUISER, SELLER HAS SPARED NO EXPENSE UPDATING THIS FINE VESSEL -- PLEASE SEE FULL SPECS FOR COMPLETE LISTING DETAILS. LOW INTEREST EXTENDED TERM FINANCING AVAILABLE -- CALL OR EMAIL OUR SALES OFFICE FOR DETAILS. 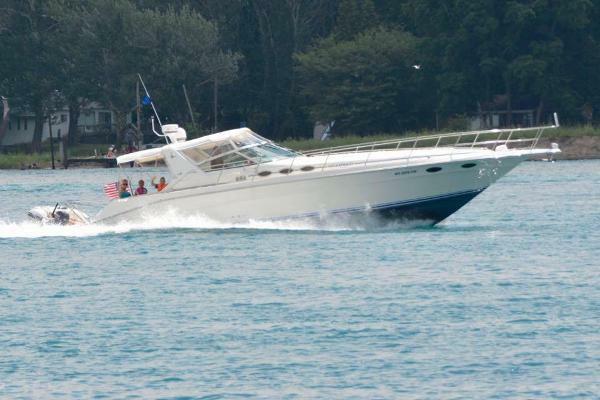 Freshwater / Great Lakes boat since new this vessel features Twin MerCruiser 7.4-litre 340-hp Gas Engine's with 933 original hours. Notable features include but are not limited to the following: Air-Conditioning & Heat (2-Units w/Digital Controls), Head (Vacuflush) w/Vanity/Sink/Stall-Shower, Quicksilver 7.5kw Generator (944-Hours), Windlass Anchor w/Polished Stainless Steel Anchor, Complete Electronics Package w/Garmin 5212 Color/Touch Screen Radar/GPS/Chartplotter/Depth Sounder, Raytheon Autopilot, Premium Clarion Sound System (Bluetooth) w/JL-Audio Speaker's & Sub-Woofer (Note LED Speaker Ring's), Stamoid Camper-Top Canvas Package w/Screens, Snap-in Snap-out Cockpit Carpeting, and MUCH more! Broker Notes: Exterior finish shows in above average condition. Newer Stamoid camper-top canvas package w/screens, stamoid windshield cover, stamoid fender storage cover. Updated exterior tape striping, sea-deck on swim platform, LED nav-lights, underwater lighting, newer cockpit carpeting, Winegard G2 Direct TV dome antenna, salon LCD-television w/soundbar, forward stateroom LCD-television. Salon updated w/newer carpeting & settee upholstery. Inside heated winter stored. Sale includes owners manuals & maintenance records. Pride of ownership shows throughout! The PowerBoat Guide had this to say: With her classic sportcruiser styling, huge cockpit, and luxurious interior, the Sea-Ray 400 Express Cruiser was considered a state-of-the-art boat when she was introduced. This was the long-awaited replacement model for the 390 Express Cruiser, and while she has less bean than her predecessor, she was a big step up in luxury and appearance. Built on a deep-v hull with a solid fiberglass bottom, the two-stateroom interior of the 400 Express offers overnight accommodation's for six. The master stateroom includes a pedestal island berth as well as a TV/VCR and a privacy door, and a circular pocket door closes off the starboard sitting room, converting it into a private stateroom with a full-size bed and convertible upper bunk. A separate shower stall is found in the head, and the large galley includes a breakfast bar and generous storage. On deck, double helm and companion seats are forward in the cockpit, while U-shaped seating aft converts into a sun-pad. An extended swim platform was a popular option in later models. 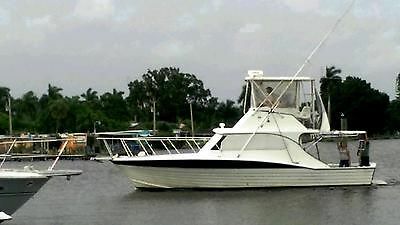 1999 Eliminator Daytona 28' catamaran with low hours on hull. 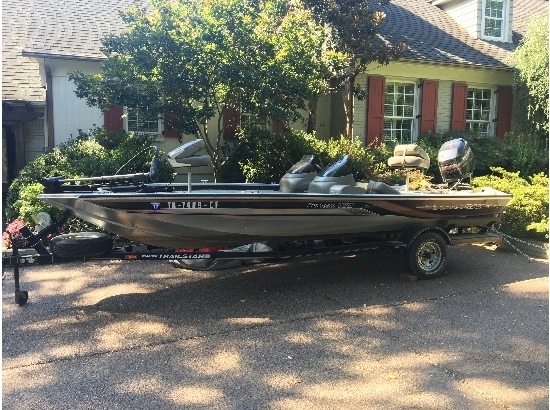 Boat comes with a 2004 Owens aluminum twin axle trailer with surge disc brakes on both axles, and has full canvas boat cover. Powered by freshly rebuilt twin 540 C.I. 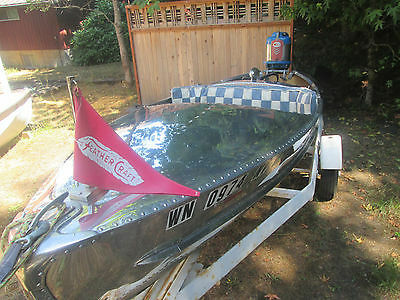 Mercruiser i/o big block engines with Gil headers producing 1,300 total H.P. 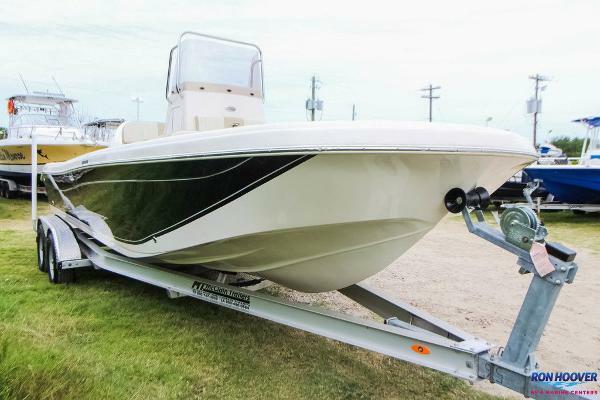 and has 1.35:1 Bravo XR Mercruiser outdrives with showers and Sportmaster lower units-oil clean with 4 blade stainless steel 30" Quicksilver Bravo 1 props. 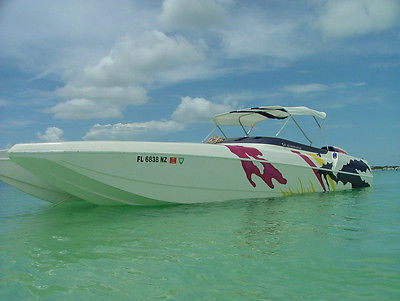 Boat runs easy 115+MPH and cruises all day at 90MPH with good fuel mileage. Outdrives have just been serviced and have very low run time on them. Has IMCO hydraulic steering with power assist and tilt helm. Boat also has original Eliminator Bimini Top for hot summer days. Has dual 35 gal aluminum fuel tanks. Has 3 Optima gel batteries. Interior is immaculate, and the entire boat is original. Must see to appreciate the condition of this boat. Kiekhaefer controls with Livorsi gauges and bezels. Clarion XMD3 CD stereo with amps and 6 speakers.Replacement value at $365,000.